9 YRS Changzhou Lintel Display Co., Ltd.
3 YRS Hangzhou Jepar Display Co., Ltd. Sample lead time 5-10 days after confirming Production Time About 20days after receiving official P.O. Our factory products with advanced technology , high strength, good quality and low price . We heartily hope to create a brilliant future with our worldwide friends. 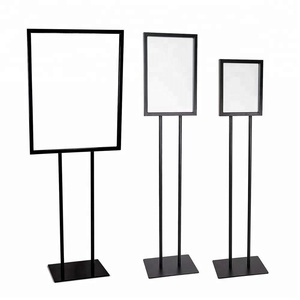 Acrylic Floor Stands are great for: banks, hotels, and all of your store fixture needs. 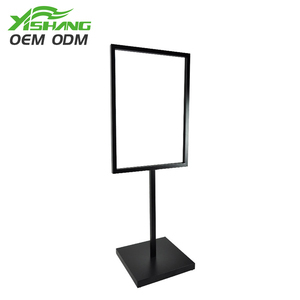 Floor stand base manufactured from black acrylic and can be customized to any size. 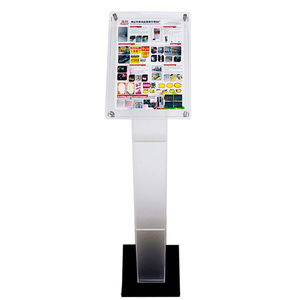 This product features a 350*400 sign holder and sign holder can be customized to any size. .
1 YRS Dongguan King Acrylic Products Co., Ltd.
3 YRS Guangzhou Landscape Display Products Co., Ltd.
5 YRS Shenzhen Love Heart Product Co., Ltd.
4 YRS Changzhou Lintel Display Co., Ltd.
2 YRS Shanghai Blue-Sky Design & Display Engineering Co., Ltd.
2 YRS Yuyao City Fanglong Display Equipment Co., Ltd.
3 YRS Dongguan Toptrend Electronic Technology Co., Ltd.
BDF-0050 Metal Bulletin Poster Sign Holder Price Negotiable Usage Ideal for Poster sign holder Material Iron Finish Chrome, Power coating Size 1422"W x 28"H Insert. We work hard to provide customers with the most satisfactory products and service. We have six series of thousands products, slatwall series, gridwall series, pegboard series, crossbar series, wall mounted series and display stand. 3 YRS Fujian Arrival Plastics Co., Ltd.
6 YRS Jinjiang Yoda Metal Products Co., Ltd.
14 YRS Hangzhou Chuangqi Display Products Co., Ltd.
11 YRS Sate-Lite (Foshan) Plastics Co., Ltd.
8 YRS Zhongshan Detron Display Products Co., Ltd.
2 YRS Ningbo Tefa International Trading Co., Ltd.
4 YRS Suzhou Ownace Commercial Equipment Co., Ltd.
3 YRS Taizhou Hili Metal Products Co., Ltd.
1.This frame with popular design,easy to assemble and dismantle. 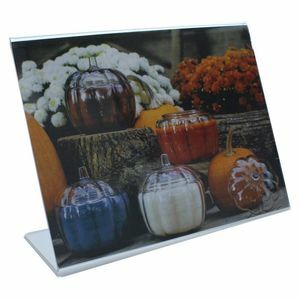 3.Customized metal displays for promoting your brands in grocery stores and retails environments. 4.Increase sales,maximize store space and improve labor efficiency. 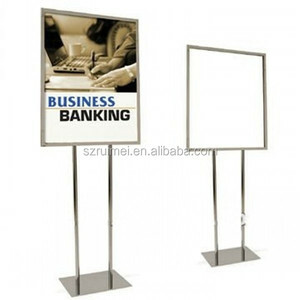 Alibaba.com offers 1,033 floor stand sign holder products. About 72% of these are display racks, 2% are other store & supermarket equipment. 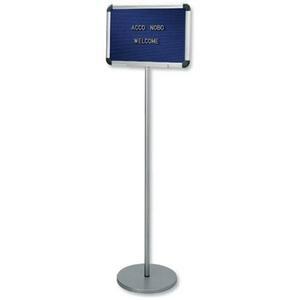 A wide variety of floor stand sign holder options are available to you, such as free samples, paid samples. 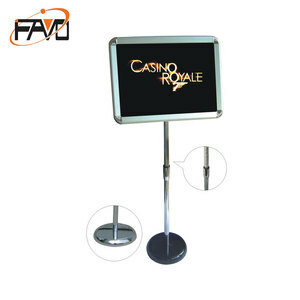 There are 1,033 floor stand sign holder suppliers, mainly located in Asia. 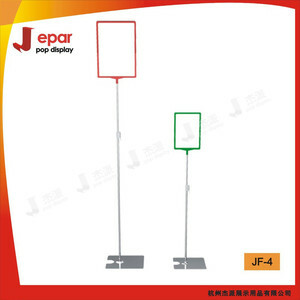 The top supplying country is China (Mainland), which supply 100% of floor stand sign holder respectively. 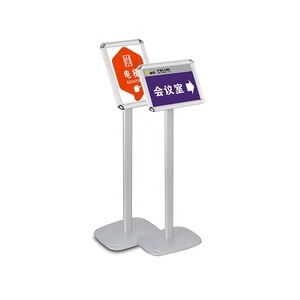 Floor stand sign holder products are most popular in North America, Western Europe, and Domestic Market. You can ensure product safety by selecting from certified suppliers, including 225 with Other, 163 with ISO9001, and 37 with ISO14001 certification.